Metal buildings can be a real challenge when installing WareHouseFoil™ because there is not a one-size-fits-all install method. 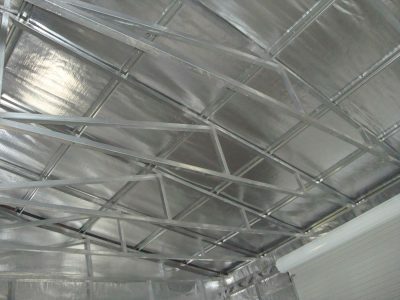 Finding a good and efficient way to install the radiant barrier foil can add cost and labor to the project, but once you just get it done, you will immediately feel the difference in comfort. Keep it simple – just get a piece of foil between you and the hot roof. Wood strips, straps, cables, adhesive, magnets… you name it. Whatever it takes to get the foil between you and the roof being heated up by the sun is the only thing standing in your way. Pretty is nice, but not important. It’s OK if the WareHouseFoil™ is wrinkled, crooked or sags a little bit – it still works! A big metal box (i.e. your building) is gonna be HOT in the summer! Installing a radiant barrier is almost like putting the building in the shade, it can make a big impact. When possible, the easiest install method for all metal buildings is to go up and over. If you have some rafters or purlins that are a few inches to a couple feet below the roof, this is a perfect place to run the foil on top. Often, you can run several pieces the full length of the building. This is a great method for the 60″ wide WareHouseFoil™ or you can always tape together two 48″ wide pieces to form an even wider piece (use foil HVAC tape for joining pieces together). The main thing to remember here is to cover as much as possible. You might have to leave some “gaps” between the strips of WareHouseFoil™. While this will cause there to be some reduction in the overall effectiveness of the radiant barrier, the benefit of covering most of the area is much greater so it’s worth the installation effort. The honest truth is there is really no easy way to attach radiant barrier to heavy gauge metal. One option is to attach something to the metal that you can staple the WareHouseFoil™ directly on to. Many of our customers have had good success by cutting 3/8″ thick OSB or Plywood into strips about 1-2″ wide. Then, they attach the wood strips to the metal framing with either with screws or adhesive. (Gorilla glue and C-clamps work great!) Once the wood stripping is up, you can easily use 1/4″ staples and attach the WareHouseFoil™ to the wood, just like you would if the building were a wood-framed metal building. Follow the guidelines for a normal staple up, overlapping pieces if necessary and leaving gaps around the perimeter. Think of a guitar string pulled tight on a metal beam. The foil could go between the strap or cable and the metal. WareHouseFoil™ is heavy duty but not real heavy. Secure strapping, wires or cable should work well to easily hold the foil up. Zip ties are also very popular and if you have supports that you can tie to, this option works well and is easy and inexpensive to do. Using an adhesive rated for high temperatures works best in all metal buildings because they get hot. You can go with a brush-on adhesive, a spray-on adhesive or a tape adhesive. One downside to consider when using adhesives is they can be messy, and expensive. If you decide to use adhesive to attach your foil to the metal, simply brush/spray it on and attach the foil. 3M makes one (3M™ Hi-Strength 90 Spray Adhesive) or you can use a Liquid Nails product and clamp it in place while it dries. Another idea is to try our foil tape product! It comes in two styles: foil or white, to match the radiant barrier color you’re using and the rolls are 2″ wide so you have plenty of room to attach to the foil and the metal. Yes, magnets work! We have had several customers use magnets to hold up the foil to the metal framing – round magnets, square ones, big and small. One customer got really creative and used a high temperature adhesive, brushed it on the metal, and then used magnets to hold the foil until the adhesive set. he continued doing this until he was done with the whole building. If you choose to use magnets, we recommend using the Neodymium (Rare Earth) magnets – they’re strong, easy to find, and they can be purchased in bulk. We’ve had customers use sheet metal screws, Velcro®, 3M Command Hooks, clamps, and other creative ideas. Have an idea that’s not listed here? Give it a try and tell us how it works! The main idea is to find a way for the foil to stay in place as close to the roofline as you can easily get it. Send us some pictures and we can offer installation ideas if you need them. Remember, if the biggest obstacle you face in creating a more comfortable and efficient building is installation ideas, then you are in luck because a little ingenuity can go a long way.